Yorkshire strike bowler Jack Brooks has set his end-of-season target as the White Rose go for a hat-trick of County Championship titles. JACK BROOKS is chasing a personal treble as he aims to help Yorkshire to a hat-trick of titles. Brooks is on course to smash the 60-wicket barrier for the third successive season as Yorkshire attempt to retain the Championship. The pace bowler’s season-best figures of 5-53 in the first innings against Hampshire last week, followed by 3-24 in the second innings, took him to 45 wickets from 11 appearances. Brooks has three games left to improve his tally, starting with today’s match against Durham at Headingley (10.30am). “I said last year that if I got 60 again, we’d win the league, and we managed that,” said Brooks. “Coming into this season, with the rule changes (to the toss) and flat wickets, I said that 60 might be out of my control, but it’s feasible now. Brooks is the joint third-highest wicket-taker in Division One alongside Lancashire’s Kyle Jarvis. 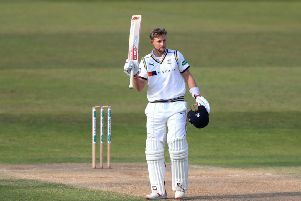 However, Jarvis and the top two on the list, Warwickshire’s Jeetan Patel (58) and Keith Barker (49), have played three more games, with Brooks having suffered a quad injury during mid-season. “I’m surprised that I’ve managed to get as many wickets as I have,” he said. “I missed a couple of games, and then there’s always going to be quiet games where I don’t get wickets, places like Taunton. Brooks, 32, has fought back from a challenging start to the season. Initially, wickets did not come easily, and there was more on his plate as Yorkshire had injuries. “I had a real tough start to the season, and I wasn’t getting the wickets I wanted,” he said. “We were missing Brez (Tim Bresnan) and Siddy (Ryan Sidebottom), so there was a lot more on my back to get wickets, and I wasn’t really getting them. “With two games left at Headingley, hopefully I can pick up a few more wickets and, if I could do it again (60 wickets), it’s something I could look back on at the end of my career. Brooks prides himself not only on his bowling, but also on his batting. He has scored 207 Championship runs this season at 41.40. “I’ve got a simple game plan, which is basically just to try and block the straight ones and get out of the way of the short ones and swing hard at anything else,” he said. “It’s going to come off every now and again, and it keeps the lads interested in the changing room. They can have a bit of a laugh and take the mickey. The value of Brooks’s batting was shown against Hampshire last week, when he shared a last-wicket stand of 47 with Ryan Sidebottom. “I’ve played quite a decent role in terms of batting with someone like Jonny (Bairstow), Hoddy (Andrew Hodd) or Brezzy over the years, when they’ve been whacking it around and I’ve been holding an end up,” said Brooks. “But, when I’m batting with another tail-ender, I try and take on the mantel and score some runs. “To get 200 runs in a season is a heavy tick for me coming in at No 10, and I was averaging 70 at one point early-season before I got out at Lancs. “When I first arrived at Yorkshire, I was batting above Patto and then I broke my thumb, and to kind of protect me a bit they put me lower than Patto, and Patto just kept churning out the runs. “In the last few years, his average has sky-rocketed, and he keeps getting forties and he’s got a fifty this year. “It’s nice to have friendly competition, but we’re all much of a muchness. It’s not as if any of us are streets ahead of anybody else. “I know that Siddy just wants to bat 11 and block the hell out of it, but I don’t like batting 11.